The purpose of this material is to place resources in your hands to go into all the world and teach the Gospel. You are welcome to download and use the Word documents and the PowerPoints as they are or edit them to suit your needs. However, DO NOT remove the truth to teach a lie. The Train the Trainer sessions will go over some basic instructions on how to present the Bible Study and how to conduct yourself during the Bible Study. Here we will share some long established “rules for the road” tips to help you present the information correctly and to be comfortable with your knowledge of the subject. Each Train the Trainer session will be focused on a specific Home Bible Study lesson and walk through each slide, adding more information to what is being presented. When the point of the topic at hand is a slide within the study, a thumbnail graphic of that slide will be shown on the screen. This will help you mentally associate the slide with the information. This is done in hopes that when you see the slide again the information will flood back to give you talking points. You will also be presented with questions, activities and even games to help you familiarize and even memorize the scriptures and the content. The Instructor Guides are intended to help guide the teacher through the content and related slides. Edit them or add your own comments. Practice and do your best to reach the point where you don't read the comments but only use them to jog your memory on what to talk about. The red "slide #" are number bullet points that automatically updated when one is deleted or added. The slide number coincide with the PowerPoint slide numbers. If you delete or add a number to either you will need to make the changes to both. Any text highlighted in red indicate there is an animation on the PowerPoint slide. You will need to click to make the animation run or remove the animation before the class. All Bible scriptures are listed in the King James Version and will be noted with a black line box drawn around the scripture. This will make it easy for you to change the version of the text use if you wish to. Note the scriptures are also shown on the slides. Throughout the study there will be group answer questions. Most of the time the questions are shown on the slide and the you will need to click to advance the animations to reveal the answers. 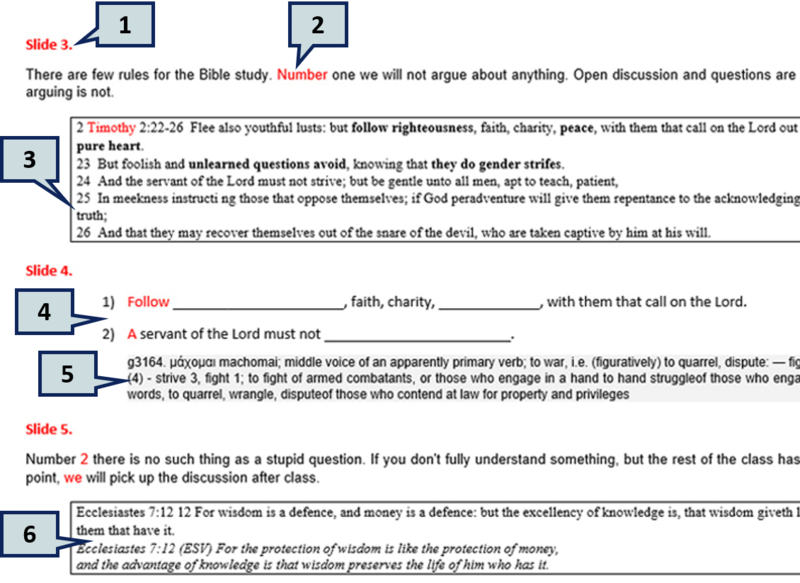 This is a copy/paste of a Strong’s Exhaustive Concordance of the Bible reference. Sometimes it will be included on a slide for the students to read but most of the time it only extra reference for the teacher. When more than one version of a scripture is offered the version will be noted in parentheses (ESV). PDF's of the Instructor Guides and handouts are offered for those who do not have Microsoft Word. Student Handouts are optional. Some students love them while other don't want to fill them out. Offer them as take-home notes to help them remember the study. It is a good group activity to go over the pages and see who can answer the questions. This helps the students who didn't understand the concepts the first time. If you do not have PowerPoint installed on your computer, you can use a the Office Online version. Click here to install. You may purchase a copy of Office365 for around $10 per month. Click here to purchase. We must use royalty free graphics to offer the PowerPoints for free download. If you intend to use the PowerPoints on your own computer, you may want to switch out the graphics. To do so go to Google.com and type in a search word such as “Moses”. Click on the “Images” filter. You will see a page full of full color graphics in all styles. If you need to use the royalty free graphics click the Tools button to open filters. Click the Usage rights drop down and select “Labeled for reuse”. To use one of the pictures, click on it to open a preview on the screen. Right click on the picture and select copy. Go to your PowerPoint and locate the correct slide then right click > Paste. If the pasted picture is too small click on the picture and then use the bounding boxes, shown at the corners as white circles or squares, to change the size of the picture . Click and move the picture until it reaches the correct size. 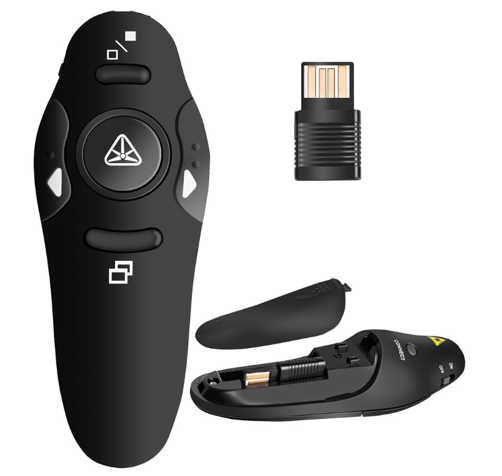 There are many versions (and price ranges) for the presenter remotes. This one is inexpensive and works great with any PC or MAC. The USB does not need to be installed and will plug and play instantly. The USB remote work at a range of up to 39-feet. The laser pointer is not helpful with TV monitors because you can't see it.